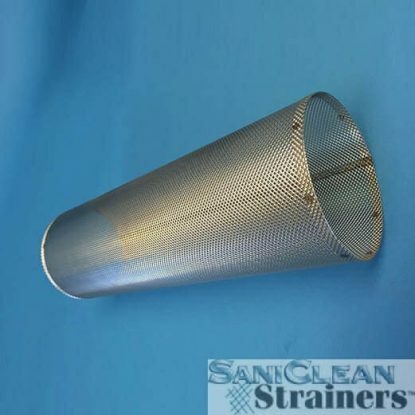 Sanitary SKS Overscreens | SaniClean Strainers | All material 316L SS. SKS OverScreens are not Wire Mesh OverScreens nor are they your typical stainless steel mesh screen. Our trademarked term ‘SKS OverScreen’, means Sanitary Kleen Screen. SKS OverScreens have no wire intersections as wire mesh does. No place for product entrapment between the wires at their point of intersection, less chance of product contamination. The SKS OverScreens are available in similar opening sizes and open area percentages as the Wire Mesh OverScreens, but again, no wire intersections. The SKS material is produced by piercing stainless steel sheet in a repetitive pattern, producing a product that at first glance looks like wire mesh, but again, it’s not. It mimics ‘expanded metal’, except with much smaller holes. Our SaniClean SKS OverScreens are available in mesh equivalent openings from a 12 mesh down to a 100 mesh. All material 316L SS. Same as our Wire Mesh OverScreens, the SKS OverScreens are fabricated correctly; tack welded and continuously welded using a welding mandrel ensuring a consistent ‘slip fit’ diameter over the perforated core (Back-Up Tube). The SKS OverScreens are individually packaged. 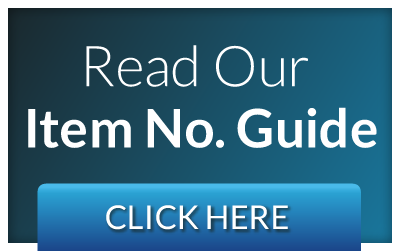 Each package is labeled with the part number and the SKS specification size. Contact us today for more information on our SKS Overscreens today.